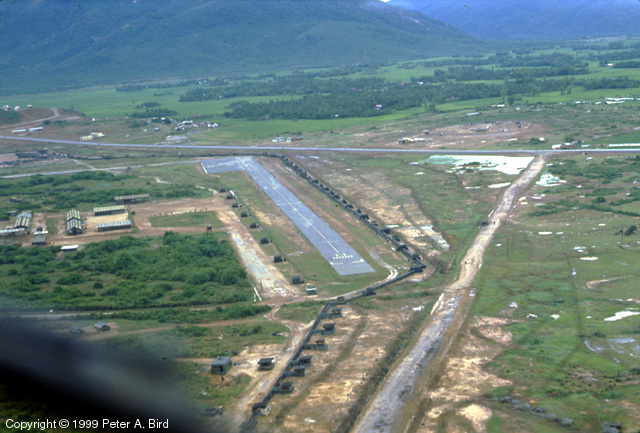 Ninh Hoa was a small, fairly secure airfield just north of Nha Trang which we used a lot for training. Since I was undergoing Instructor Pilot training at the time, this photo was taken from the right seat during an approach. The runway was exactly 2,000 feet long and the objective was to land, come to a full stop, and then take off from the point where you stopped. Perhaps you can get some idea for how steep an appraoch we flew in a STOL configuration as we roll into final approach position in this photo.